OK, it's almost Passover. If you believe the media hype, terrified Jewish housewives and Passover greeting cards, it's a week of crunchy dry cardboard and brick-like cakes. Plus brisket of course. But it's not true! 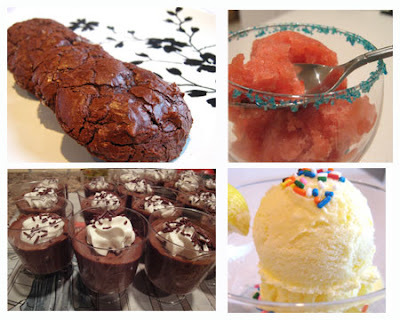 Even without the flour - and without making a cake from matzah meal - you can have delicious, light, gluten-free desserts that you'll find yourself dreaming about year-round. 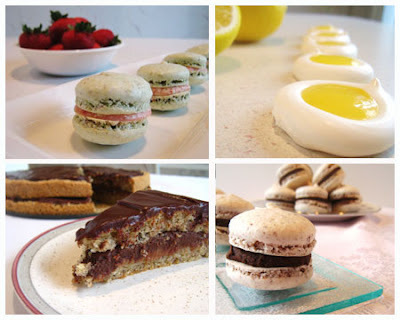 Clockwise from top left is Strawberry-Lime French Macarons, Lemon Meringue Thumbprint Cookies, Raspberry Almond Chocolate Macaroons and Hazelnut Cake with Chocolate Ganache. 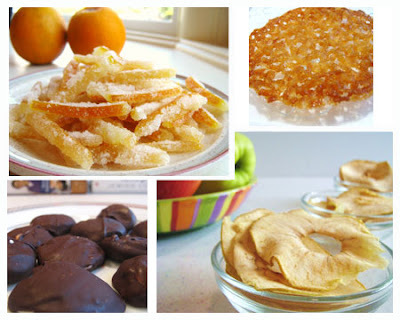 Clockwise from top left: Candied Orange Peel, Coconut Lace Cookies, Apple Chips and Peppermint Patties. Clockwise from top left: Chewy chocolate cookies, Strawberry sorbet, chocolate mousse cups and lemon ice cream. Everything on this page is flour-free, gluten-free and completely delicious! Great idea. Will use it for my clients. the strawberry sorbet was awesome!